Faraway Press: The Online Home of John Jackson Miller: Support Comix4Sight! Auction this weekend! Support Comix4Sight! Auction this weekend! Chicago Comicon — no longer Wizard World — is this weekend, and I am there but not signing — (Dark Horse is not exhibiting this year). Still, there's a chance for Star Wars comics fans to contribute to a good cause by supporting the Comix4Sight auction for fellow Star Wars creator John Ostrander. 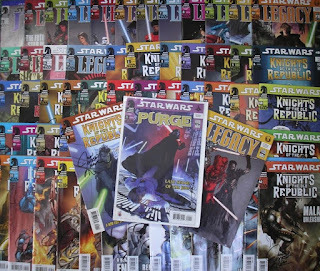 • and a complete run of Star Wars: Knights of the Old Republic, written and signed by me; this is issues #0-43, including the rare Knights of the Old Republic Handbook. That's 62 comics, 45 signed (by my count). And that pales before some of the amazing stuff on auction. Be sure to go to the Comix4Sight page to check out what's available — and be sure to bid! Knights of the Old Republic #44: Tentacle Wars! The trial of Demagol begins in November!